Welcome to the wonderful world of theatrical shenanigans. Or as is the unfortunate case in The Rainsdowne Players, the world of… dodging bottles, paper planes, tomatoes, rocks and other objects, as you attempt to woo an ever-expanding/-changing audience with one play after another. Feeling uninspired? Chat up the locals. Need a break? Play one of several mini-games. All this and more, on the (other) grandest stage of them all! 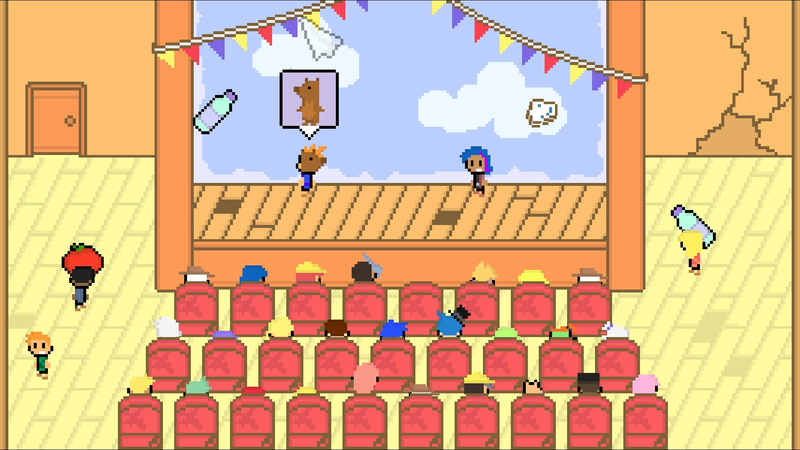 There is fun to be had amidst all the objects being randomly hurled towards the stage though, each successful resulting in monetary gain (and if you played your metaphorical cards right, perhaps even story progression). I mean, sure, you will always be forced to suffer through a relentless onslaught whenever you attempt to pull off a crowd-pleaser in the form of a new play, as put together by deducing what this or that guy/girl wants to see after asking around for hints and tips. Am I going too fast? Alright, let’s take it from the top. In The Rainsdowne Players, your goal is to become “the premier (and only!) theatre troupe in town”. At least that’s what the developer would have you believe. During my time spent in this quaint little town, I found it far more interesting to explore, talk to everyone and see what little tidbit I could dig up, who I’d meet if I went to certain locales in one weather condition or another. Of course I did keep the dream of a grand theatrical production in mind as I wandered about, seeking inspiration from fisherman, butcher, teacher, journalist and all sorts of individual. Truly a living, breathing world, this one. So, plays. Over the course of the game, you’ll be putting up a lot of these, and unless you’re simply trying to scrounge up coin for another hint… each will be its own little puzzle to solve. By which I mean that virtually every person with something to say wants to see a different scenario, and it’s up to you to figure out how to accomplish this, using a mix of ‘cards’ to tell unique stories. This is where that bit about venturing out in search of inspiration comes into play as certain conversations act as triggers to unlock more cards, while other are simply subtle hints at production requests. Always something to do in-between plays, someone to talk to, ships to blow up with fierce cannons, a tournament to win, gambling, drinking and karaoke – to name but a few of the side activities. Most even serve as yet another means by which cards can be acquired, while some exist solely to fill your pockets with ever-important coin. 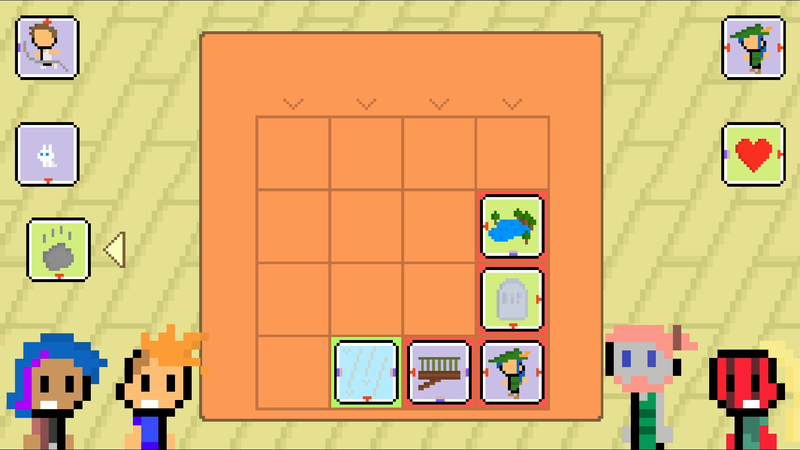 If you’re anything like me, you’ll want to amass a fair amount of wealth as hints will set you back 20 coins a piece, each of which will eliminate some guesswork from the production puzzle; but only if you’ve unlocked the hint as to what that particular NPC wants to see. Which is not always an easy task. Which brings me to the actual plays. Before hitting the stage to enchant theater-goers with your latest stroke of brilliance, it has to be, well, created. This is done by placing unlocked cards – a bear, a lake, death, wealth, etc. – into Subject, Location, Purpose, Encounter, and finally, Outcome. Once your options start to expand, the possibilities for something truly silly can be created here, although sadly, the actual appearance of what you’ve built isn’t quite as grand, leaving more up to the imagination than I would have liked. In fairness, the game would likely still be in development, were its creator to actually implement a method for showing all sorts of zany combinations of the myriad of cards in a play; and seeing how enjoyable The Rainsdowne Players is, I for one am glad to have the completed product readily available instead. Not that I’d claim the game is perfect by any means, but the aspects that annoyed me were so few and minor that the positives heavily outweighed the negatives. 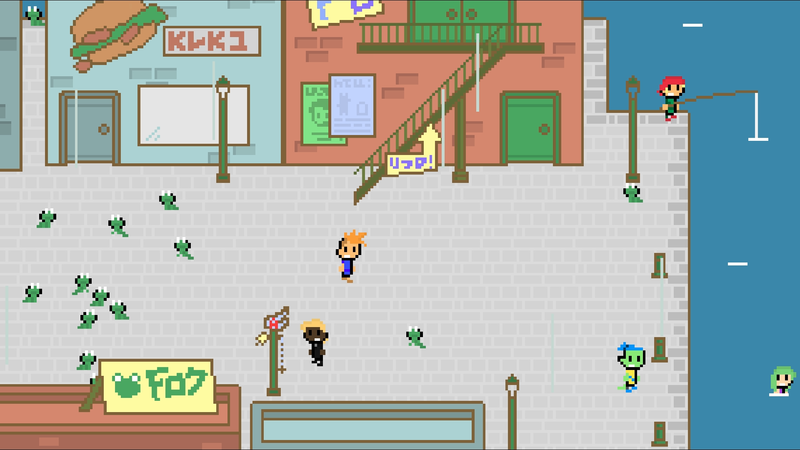 While exploring the town is fun and interesting, there is a lot to keep track of, and the notebook at your disposal only serves one purpose: to help you keep track of who wants to see what. That’s it. Managing weather conditions, locations, time of day, and so on, is all up to you. And seeing how different people show up at different times and in different weather, it can get a tad confusing late-game when you’re trying to find someone new/different to chat up. But even when I found myself utterly stumped, I told myself that the show must go on, and eventually, after waiting for a rainy day, it did, the game’s plot moving along with it. What little there is anyway, as in my experience, it seems more focus is placed on world building than anything else, what with a wealth of minor stories and/or problems to fix and all. Everyone’s got something to say and in some cases, a task they need your help with. How? Why, by putting on a very specific play, of course! From a love-stricken teenager to a bored and unruly kid, the various characters you’ll encounter are certainly fleshed out (enough to be interesting, but not much more), and at the end of the day, The Rainsdowne Players is a rather lovely reminder on the power of a theatrical production, if nothing else. Doesn’t mean the entire thing is about getting up on stage after talking to enough people to piece together a new play however, sword fighting, karaoke and a bit of yoga can also be undertaken, should you so desire. 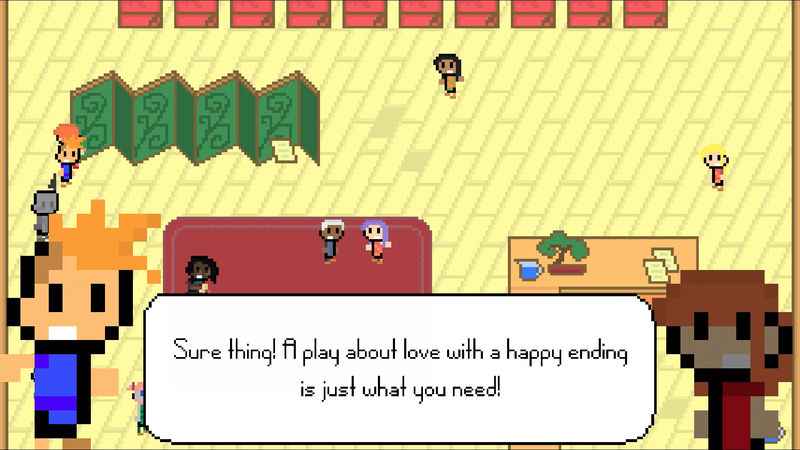 “All work and no play…”, after all, so make sure you take some time to see the sights in-between playing the left-left-right-left-right object-dodging mini game of putting on a show. Thank goodness people are more mild-mannered in the real world, or a Broadway performance would be quite an odd beast, everyone bringing ammunition for the poor actors to suffer through. All in all (cue dramatic music for the epic conclusion to the grand performance that has been this review) I’m going to recommend The Rainsdowne Players without hesitation, as in spite of flaws mentioned earlier, it’s quite easy to lose yourself in its puzzle-heavy theatrical joy. Might even inspire someone with new ideas for a play all their own, ya know? Unlikely, but… never say never. Just be sure to leave the tomatoes in the kitchen, where they belong. 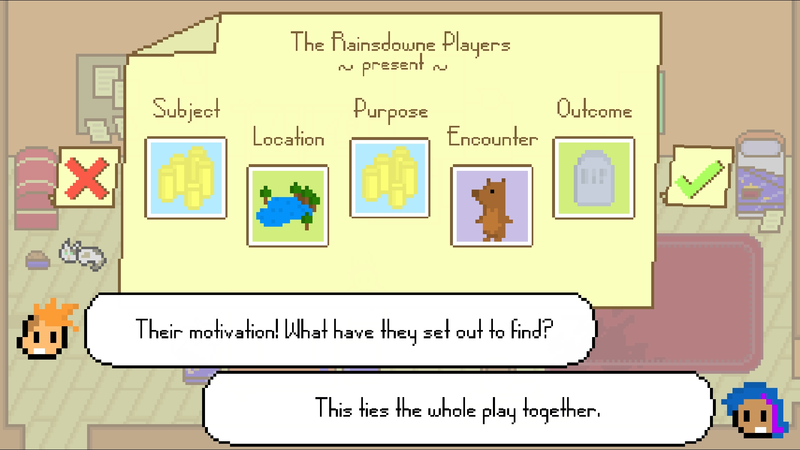 The Rainsdowne Players is available on Steam and itch.io, carrying a $3.99 price tag.